Terbinafine hydrochloride (Lamisil) is a synthetic allylamine antifungal. It is highly lipophilic in nature and tends to accumulate in skin, nails, and fatty tissues. Like other allylamines, terbinafine inhibits ergosterol synthesis by inhibiting the fungal squalene monooxygenase (squalene 2,3-epoxidase), an enzyme that is part of the fungal cell wall synthesis pathway. For the treatment of dermatophyte infections of the toenail or fingernail caused by susceptible fungi. 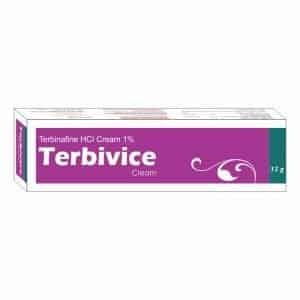 Also for the treatment of tinea capitis (scalp ringworm) and tinea corporis (body ringworm) or tinea cruris (jock itch).